Arbutus unedo ‘Elfin King’ with fruit. With evergreen, leathery, dark green leaves, showy clusters of tiny white spring flowers, small red berries in fall, and red-brown peeling bark, Arbutus menziesii is a signature tree of western North America. Native to coastal evergreen forests from southern British Columbia to California, the western slopes of the Sierra Nevada, and the eastern slopes of the Coast Ranges, this tree has long been considered too difficult for most cultivated landscapes. Commonly known as Pacific madrone, A. menziesii is available in small containers mostly from specialty nurseries and at native plant sales. For best results, Arbutus menziesii should be set out in its permanent spot when the seedling is a foot or so tall. Excellent drainage is essential. Young trees seem to prefer the filtered shade of evergreen trees, but may not establish in full shade. They thrive in full sun along the coast and inland at higher elevations. Water only to establish and do not fertilize. Water and fertilizer will promote growth but make this plant more susceptible to disease. Usually slow-growing to anywhere from fifteen to fifty feet tall, trees may reach over 100 feet at great age. 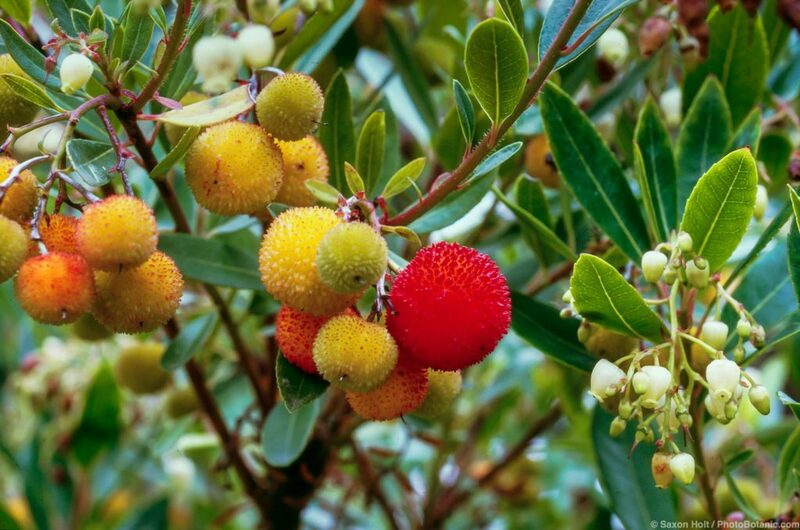 Arbutus unedo, strawberry tree, is native to the Mediterranean Basin and parts of western Europe. With evergreen, leathery, dark green leaves, drooping clusters of small rosy white flowers, largish red fruits, and peeling reddish brown bark, strawberry tree is similar in many ways to Pacific madrone but much more tolerant of garden conditions. It grows in sun or shade and most soils and accepts some summer irrigation as long as drainage is adequate. Where content, it can reach fifteen to thirty feet tall and almost as wide. Cultivated varieties of Arbutus unedo are common in the nursery trade. 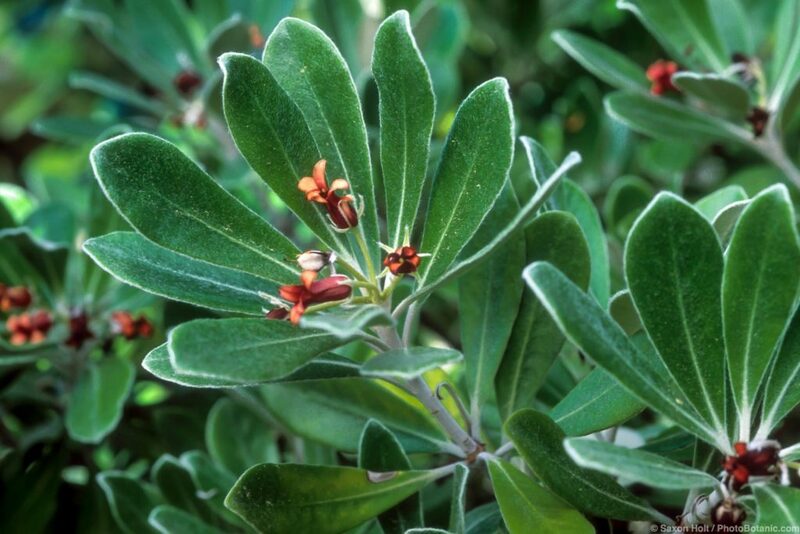 ‘Elfin King’ is a compact shrub with denser branching and somewhat slower growth than the species. 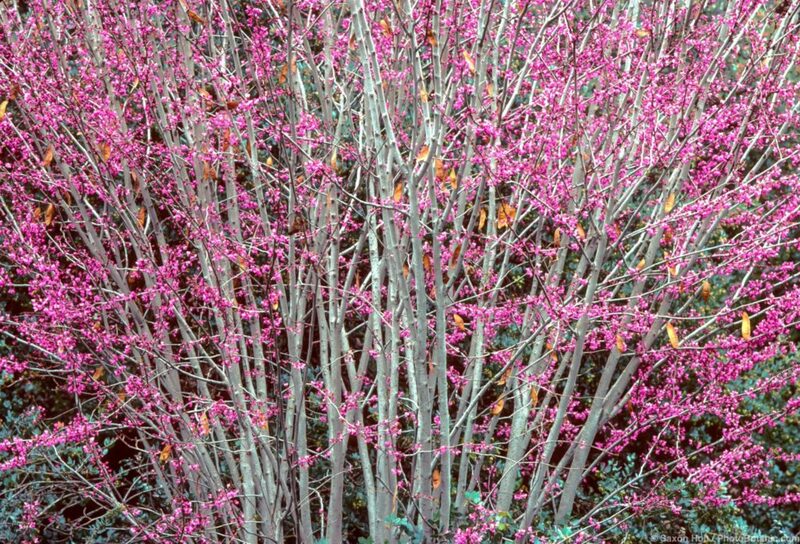 ‘Compacta’ is said to be similar, reaching six to ten feet tall and wide at maturity. Arbutus ‘Marina’ is a fairly large tree (forty feet tall and thirty feet wide at maturity) that looks enticingly small in fifteen-gallon containers. You will see it planted five feet from a building wall in new landscapes. In such situations you can be sure it will outgrow its allotted space and over time will require quite brutal pruning or removal. 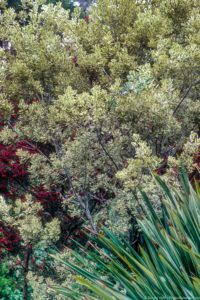 ‘Marina’ is often promoted as a garden-tolerant equivalent of Arbutus menziesii, and it is somewhat more accepting of typical garden conditions – a bit of summer water, less than perfect drainage, and clay soils. But it won’t take as much abuse as commonly assumed, especially excess irrigation or poorly drained soil. It is also best planted in a spot that can feature rather than fight the shedding of bark, fruits, and large leaves, which, as with most strawberry trees, is pretty much continuous. 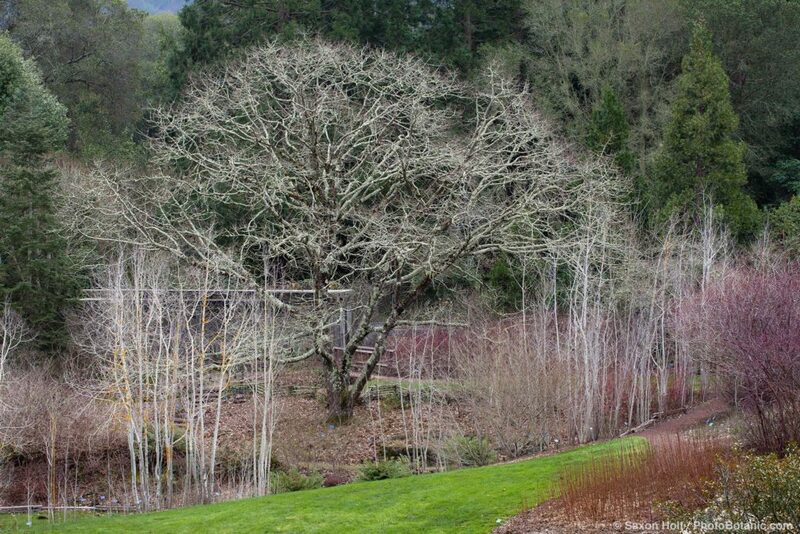 Aesculus californica, in winter, at East Bay Regional Parks Botanic Garden, Berkeley. California buckeye (Aesculus californica) puts on a bold and fascinating seasonal show. 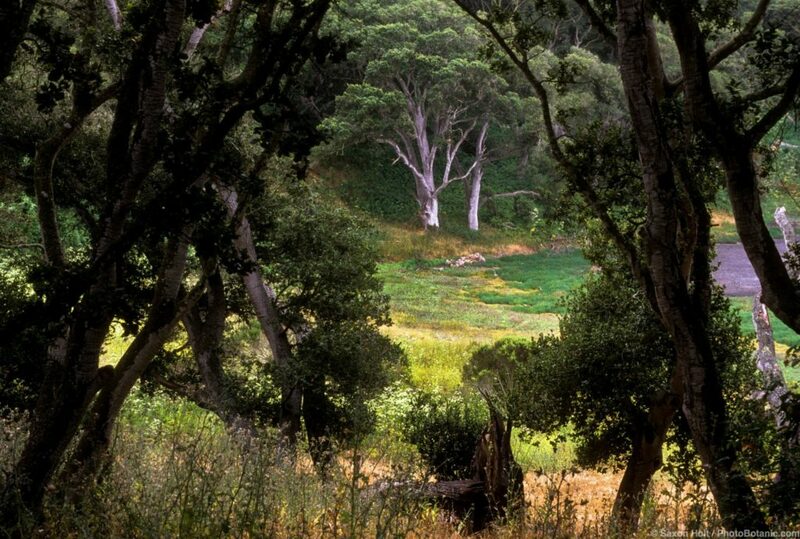 In late winter bright apple-green new leaves burst forth at branch ends and rapidly unfold, quite suddenly claiming the stage among the darker greens of evergreen oaks, bays, and pines. In spring to early summer showy spikelike clusters of lightly fragrant creamy white flowers are held gracefully upright above the leaves. 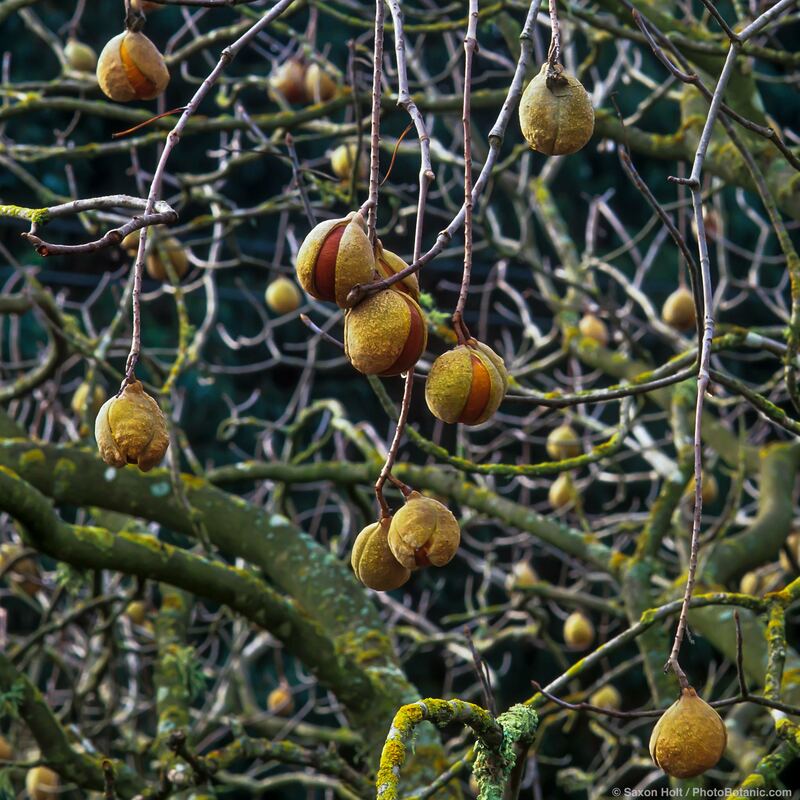 The large polished-brown seeds peeking through leathery, pear-shaped pods are highly decorative on silvery gray branches in fall. 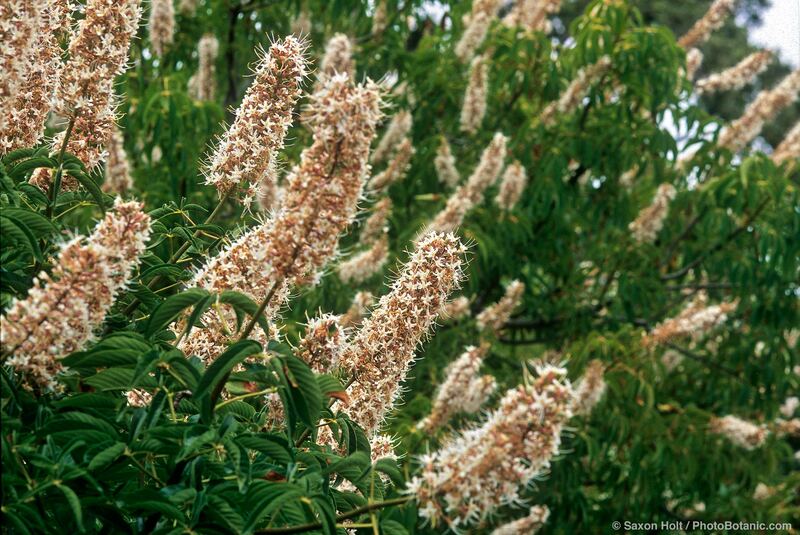 Native to much of California on dry slopes, in canyons, and along waterways, California buckeye needs no summer irrigation once established, though trees will respond to heat and drought by dropping leaves. It’s hard to be fully prepared for the large palmate leaves to turn pale yellow, droop sadly on the tree, and drop in what seems to be high summer. Occasional deep soakings may help keep leaves on the tree a little longer in coastal areas. California buckeye grows 15 to 35 feet tall and spreads more widely. Form is best in sun, where trees develop into a living sculpture of multiple or low-branching trunks, symmetrically outstretched branches, and a delicate tracery of small branchlets. Trees thrive in part shade but may be awkwardly shaped and rangy. Good drainage is appreciated. Deer will browse the leaves. In years of normal rainfall, the heavy seeds sprout and establish themselves pretty much where they fall, unless they roll downhill or are carried away by water. They can be moved before the large whitish root finds its way into the soil. Plant with the root covered by soil and the seed at least partially exposed. Keep soil lightly moist until new growth is decisively underway. Water for the first year or two, especially if winters are dry.